Luckily, this series understands that level of nuance and manages to pull off Hannibal’s backstory with just enough ambiguity to both acknowledge the book’s story, and yet leave us wondering about what is true and what is obscuration, what is cause and what is effect. 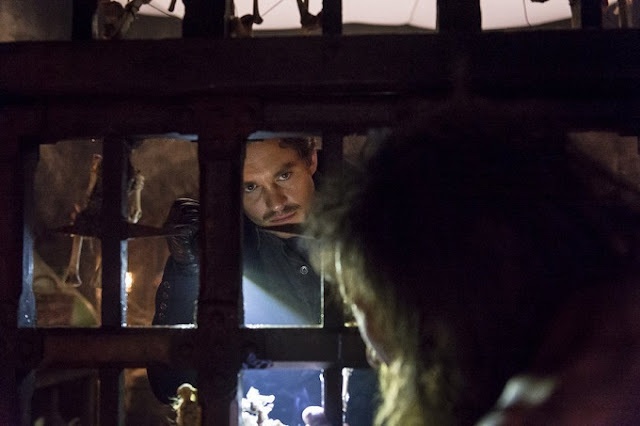 The bookends are of particular interest because they frame the idea of both love and forgiveness as something that happens involuntarily - something that Hannibal is powerless to control. This may well be the first time that the show has come right out and said that Hannibal loves Will (at least, the first time that wasn’t part of a dream sequence), though they’ve surely implied and hinted at it often enough up to this point. The other scenes between Hannibal and Bedelia in this episode would almost not be worth mentioning separately except for a) the return of the incredibly thick ‘who’s about to die?’ tension between them in a bizarrely creepy scene where Hannibal shampoos Bedelia’s hair, and b) what might be simultaneously one of the most disturbing and one of the funniest dinner sequences on the show. Eventually Will discovers a strange, withered man being held in a cell in what appears to be a wine cellar of some kind on the grounds. Before he can interact with the man much, Will is intercepted by the groundskeeper from earlier, a woman named Chiyo. She brings Will into her home (mostly at gunpoint) and after he shows her the scar that Hannibal left him, she tells Will about Hannibal’s past. She claims that the man in the cell was discovered eating Mischa, Hannibal’s younger sister. Hannibal insisted that if she wouldn’t let him kill the man, then she was responsible for that man’s life, and hence Chiyo has been keeping the man there for decades, keeping him alive but letting him go slowly insane. The truth about what actually happened with the man and Mischa is left murky; Chiyo says Hannibal found the man eating Mischa, but she has only Hannibal’s word on that. 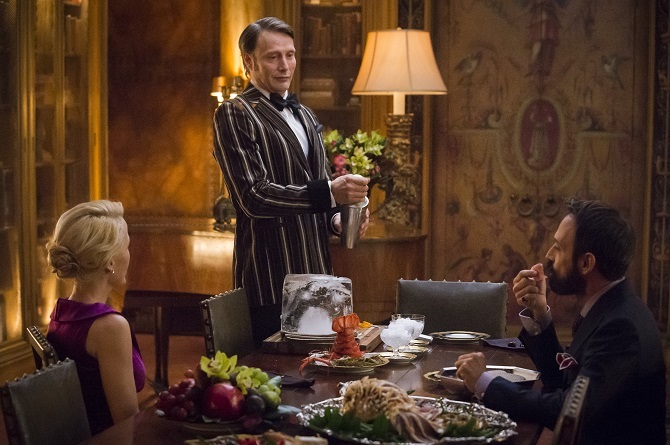 Bedelia and Hannibal’s conversation implies that Hannibal is the one who ate her. 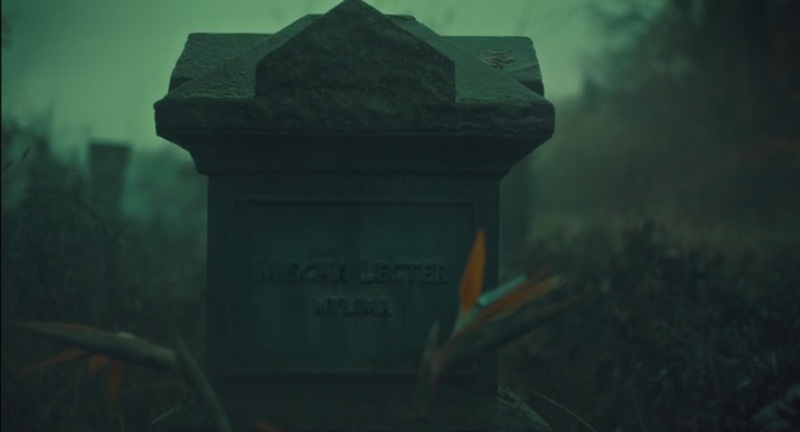 What exactly happened to Mischa and how far the man and/or Hannibal were involved in it is ambiguous, and perhaps should rightly stay that way. In an attempt to free Chiyo from being shackled to her care of the insane man, Will sets him free and tries to get him to leave. But the man returns to his cell - now sans lock - and instead ambushes Chiyo when she next comes to feed him. Chiyo kills the man in self-defense. Though Will, who came rushing in upon hearing her screams, claims this was not the outcome he intended, Chiyo believes differently. Hannibal was curious as to whether she would kill, if it came to it. She accuses Will of following in his footsteps; manipulating events and then watching them unfold to see what happens. “He would be proud of you,” she says. Will gives her some wine and sends her to recover from the trauma of taking a life, and then sets to work on the dead man. He creates a murder tableau fit for Hannibal, dressing the man up as a firefly with wings made of pheasant feathers and broken glass. He leaves the man trussed up and hanging in midair in the dark of the cellar, presumably to be found in such a state by whoever comes next to this place. Once she’s calmed down, Chiyo agrees to help Will find Hannibal, now that she has no duty tying her to the castle. She and Will set off together to do just that. I loved this episode. Of course I did. Like all of the season so far, it was quintessentially Hannibal: moody, dark, beautiful, and strange. Tense at times, and weirdly funny at others. It delves into the psyche with surrealism, and horrifies as much as it attracts. I’m eagerly looking forward to more. * Oh, also Jack is back this episode and hanging out with Pazzi in Italy while theoretically tailing Will Graham. He’s not in it much, and honestly I didn’t find his scenes that interesting except for his speech about how they all died in that house. But yeah. He’s there also. ** The dinner sequence also starts with a sort of cinematographic “joke” that the series has used often before, but reversed. 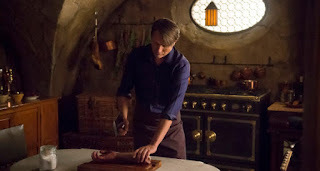 Often when showing Hannibal cooking up body parts, they’ll do something like show Hannibal about to cut into someone’s chest or something, but then cut to something innocuous, like the same knife cutting through vegetables. Here they show Chiyo plucking a pheasant, and about to cut off the bird’s feed, and then the shot abruptly switches to Hannibal’s cleaver slicing through a hand. It’s incredibly jarring, but I must admit I laughed watching it with someone the second time and getting to see their startlement. *** This results in one of my favorite cinematography moments of the episode. Will fantasizes them back into Hannibal’s office, but it’s all shot through some kind of textured glass filter that makes everything look fragmented and unreal. I feel like I need to start including just a straight-up list of my favorite shots from each episode in these recaps. So many of them are so gorgeous. **** The official hashtag from the studio for this episode was “#SnailedIt,” by the way. I’ll say this of DeLaurentis Co - at least they get the fandom sense of humor. I’m wondering what snails are supposed to signify here though. The cycle of life and death, perhaps? Eater and eaten? ***** Speaking of Alana, it looks like next episode we’ll get to see what happened to everyone else in the murder house at the end of season 2! Are you excited? I’m excited. The very definition of smug. Kyla Furey is an independent game designer and writer. She is also one of the hosts of the game-analysis podcast, Feedback Force, and hosts a weekly Saturday night game livestream on Twitch TV. She enjoys the surreal and the moody in her media, hence her great love of NBC’s Hannibal. You can follow her on Twitter @Kyla_Go where she livetweets Hannibal on Thursdays at 10pm Pacific, following which, she posts delirious stream-of-consciousness reaction videos on YouTube. In the Hannibal book series, the origin story book “Hannibal Rising” is often cited as being the worst of the series at least in part for this reason. Ugh, the book series should have stopped after Silence of the Lambs. Or at least shouldn't have completely destroyed everything that made Starling so cool (she and Will Graham teaming up to recapture Hannibal and succeeding would have been a book I'd have preferred). But anyway. He leaves the man trussed up and hanging in midair in the dark of the cellar, presumably to be found in such a state by whoever comes next to this place. Which I assume would make the news enough to come to Hannibal's attention; is that the point? I’m excited to see how Chiyo pans out as a character, honestly. I think she has a lot of potential, and I hope they do something interesting with her besides simply making her Will’s love interest. 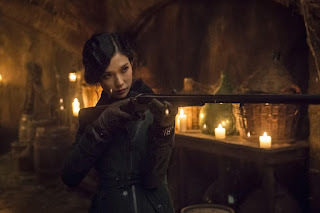 Is she a characer from Hannibal Rising, or original to the series? Kyla knows a lot more about this than I do, but I definitely think that the goal is to get the news involved sooner or later, because if we all understand that Hannibal will never go back there, then there aren't that many ways he'd find out, right? If the news isn't involved? Maybe Will is depending on their deep psychic connection or something. Anyway, Kyla's much better answer is below. 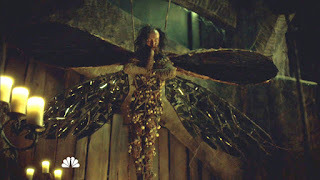 Yeah, I assume the Firefly Man was left for Hannibal in the same way that the Broken Hart was left as a message for Will. They don't come right out and say it, but it seems like a decent assumption; we'll have to see how it plays out in the coming episodes. As for Chiyo, I believe she is a minor character from the books, the maid of Hannibal's aunt, Lady Murasaki. I haven't read the books myself, so I don't know all the details. My impression is that Hannibal had some kind of weird, cross-generational affair with his aunt (or one-sided affection? I don't know...), and that she's part of his formative years story. And I guess Chiyo is somehow involved there, or in the background of that period of Hannibal's life? I don't actually know; I try not to look into the books too much because I want to more freshly enjoy what they're doing with the show.